We previewed this Saturday Night’s NXT Takeover: Philly, featuring the NXT Championship Match between Andrade “Cien” Almas against Johnny Garganno, NXT Womens Championship Match with Ember Moon against Shayna Baszler and more. We were joined by NXT Analyst TJ Omega and the Assistant to the Assistant to the NXT Analyst The Intern. 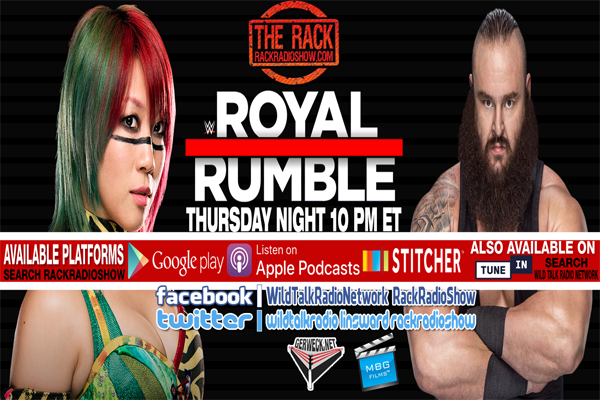 We also previewed this Sunday’s WWE Royal Rumble event which includes two Royal Rumble Matches, a Triple Threat Match for the WWE Universal Championship, a Handicap Match for the WWE Championship and more.